Over recent years TBI has found that our Children students are learning more and more through the application of new technologies and with this in mind we have been working on new developing approaches and programmes that will allow us to better engage these ‘digital natives’. This incredibly deceptive claim can be found on the TBI website. “Islands” is copyrighted to Pearson-Longman, the respected British publisher, and yet the deceitful TBI deliberately sets out to mislead customers that this is their program. With many complaints piling in that they are “behind the times” in the online learning stakes, they have once again reverted to type and start misleading people. Pearson worked on and developed this program, “Islands”; TBI merely bought it at a shop. It is completely misleading and deceitful for them to write, “We have been working on and developing new approaches and programmes”, when they had ZERO input into developing this software. Let’s just use a simple analogy to show how low their business ethics are. I currently own a license to use Microsoft Office. Can I now claim that I worked on and developed Microsoft Office? If I made the claim, you would be entirely justified in calling me a bare-faced liar. While I have the right to use the program, by virtue of a payment I made, I played no role whatsoever in developing the program and would be lying if I said otherwise. This is exactly the same situation with TBI and the “Islands” program. They bought a license to use it off Pearson but they are now making highly misleading claims to be the developer of the program. This is yet more proof that they are a dishonest, shady operator who lacks professional integrity. They also repeat the word “our” over and over again, creating and reinforcing a misleading and deceptive impression of ownership/possession/authorship. These are the desperate tactics of the con-man and the imitator, out to defraud their own customers. They even go so far to refer to “Islands” as a “TBI program” when they do not own any intellectual property rights over it whatsoever. (See below). This is simply not how reputable, respectable schools operate. While their competitors really develop books and software, TBI buys them from Pearson and falsely claims them for their own. TBI is now able to announce the introduction of a new TBI programme called ‘Islands’ which is an innovative new course for 7-9 year olds that makes learning English an exciting and engaging experience. Judge for yourself how much integrity and honesty this school possesses. 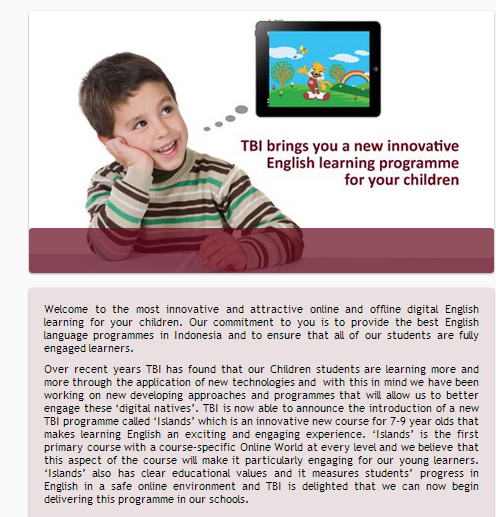 August 20, 2014 in (TBI) The British Institute, TBI Bali, TBI Fatmawati, TBI Kuningan, TBI Sudirman, Teacher Recruitment.